.....Nothing is known of Louisa other than the basic facts of her life. She moved, most likely with her parents but certainly with several siblings, from Weathersfield, VT, to New York State. Although the Whites eventually settled in Utica, evidence and the lack of it suggests they did not go there directly from Vermont. 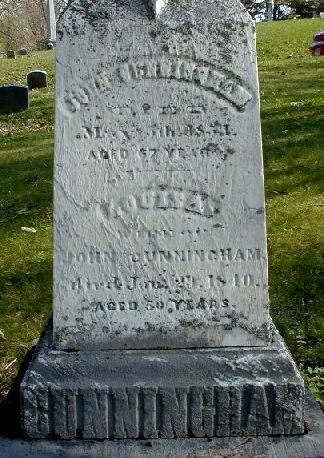 Given that John Cunningham was living in Richfield, NY, when he married Louisa about 1810, it is most likely that the Whites were living in the same area, but not as far away as Utica. There was a widow White and a John White in Edmeston, several towns away from Richfield, in 1810. 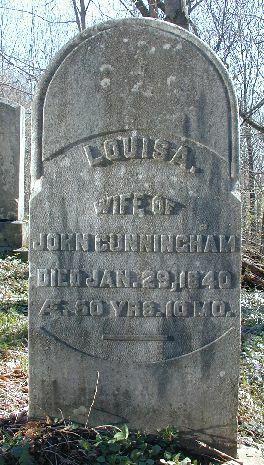 Louisa had a brother named John (Jr.), and his children are know to have lived in Utica when Louisa's siblings (and likely her mother) were there. Louisa lived in Richfield and died there of unknown causes when she was 50.
vital records sources: Louisa's death is recorded on her two memorial stones, one in Richfield, NY, and the other in Utica (see above).